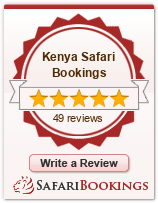 Pick up from your hotel at around 8.00am and drive southwards along the floor of the Great Rift Valley with a stop over at the view point with picnic lunch on the way arriving masai mara in the afternoon.After proceed for evening game drive dinner and overnight at Mara sidai camp with facilities of hot swower and toilet inside the tent. Pre-morning game drive and after late breakfast leave the camp for Nakuru with picnic lunch at Narok arriving Nakuru in the evening if time permit proceed for short game drive. Dinner and overnight at a budget hotel or YWCA guest house. After early breakfast, morning game drive to L. Nakuru national park where you are going to see alot of flamingoes and other birds. You also have the chance to see the black and white rhino. After depart to Amboseli via Nairobi with picnic lunch on the way arriving in the evening. If time permit you can have short game drive to see mt kilimanjaro and big elephants. Dinner and overnight at Kimana camp. There is private bathroom but outside the tent not like masai mara which is inside the tent. Early breakfast then proceed for morning game drives exit the park and, we drive into Tanzania via the Namanga border. We also pass through Arusha to Lake Manyara National park with lunch enroute arriving in the evening.If time permit proceed for evening game drive and the main attractions are its rich bird life, tree climbing lions and its hippos, which you can see at a closer range than many other places dinner and overnight at the camp. Morning game drives at Lake Manyara National park a shallow also hosts thousands of flamingos at certain times of the year and has diverse vegetation ranging from savannah, to marshes and acacia woodland, enabling a variety of wildlife habitats including butterflies. Later proceed to Serengeti national park arriving in the evening game drive enroute to the campsite for dinner and overnight stay at Seronera camp. After breakfast with picnic lunch proceed Morning game drive, then leave Serengeti for Ngorongoro with an optional stop at Olduvai Gorge,a river canyon cut a 100 metres deep through the volcanic soil of the Serengeti plains. Buried in the layers are hominids and remains of animals that lived and died more than 2 million years ago. The guides will give you on site information of the gorge. Proceed to Ngorongoro for dinner and overnight at the camp. After Breakfast, depart for the Ngorongoro crater with your picnic lunch for a full day of tracking game in the crater floor. You will break for your picnic lunch at the Ngoitoktok springs picnic site. All the big five may be seen. This huge caldera or collapsed volcano is 250 square kilometres and 600metres deep. Its spectacular settings and abundance of wildlife makes it one of the natural great wonders of the world -is referred to as the eighth wonder of the world or the EDEN of Africa. Late afternoon drive back to Arusha to end your trip.